The heat may be on where you live, but here in Big Bear Lake, the skies are clear and the temperature is absolutely perfect! We have highs in the upper 70’s this weekend. Beautiful!! The coming week will bring more clear skies and temps in the mis-70’s. It’s Labor Day Weekend, and in Big Bear Lake we have gorgeous, fall-like weather and a whole host of things to do! Come on up and enjoy the final weekend of the summer season!! We have just a few cabins left for this holiday weekend, so head over to RSVacations.net if you are looking for a last-minute deal. We are also already starting to get bookings for the Christmas season, so if you are planning to enjoy the Holidays in Big Bear, make your reservation soon!! Book your Big Bear Cabin today!! The beautiful Fall Season is beginning in Big Bear Lake and you know what that means! Oktoberfest is here!! Along with this annual festival, we have many more special events going on, and as always, tons of activities you can take part in while you’re here. All of our Summer activities (lake, mountain biking & more!) are still going strong as well, so come up and see what a 4-Season Resort is all about! We know you have many choices when it comes to renting a vacation cabin in Big Bear. When you book with RS Vacations, you will get quick responses to your emails, texts and calls; a simple booking experience; the ability to head straight to the cabin when you arrive in Big Bear; a clean and ready cabin; and a local management team that will immediately handle anything that comes up. We want your trip to be stress-free, fun and memorable! Visit us today at RSVacations.net and find the cabin that is just right for you. Book your Big Bear Cabin today!! The Holcomb Valley Rendezvous is an authentic hunting and gaming camp created by a troop of historical re-enactors called the Big Horn Mountain Men. A living History Encampment of the Fur Trade Era of the American West, spanning the time period of the French and Indian War (1700) to 1840. Fun for the whole family – Step back in time and visit a high mountain encampment of Mountain Men and their families. Meet colorful characters in costumes of the time period. See history come alive with demonstrations of primitive skills: flint and steel fire starting, Dutch oven cooking, basket making, leather work, scrimshaw, tomahawk and knife throwing, target shooting with muzzle loading rifles, pistols and trade guns. Mountain Men live in tipis and a wide assortment of period canvas tentage; trade goods and primitive clothing available for sale at several traders. Visitors welcome with or without period costumes! For more details please check website or call. Art on the Corner : A New Art Show in the Heart of Big Bear Village on the corner of Village Drive and Pine Knot Avenue. 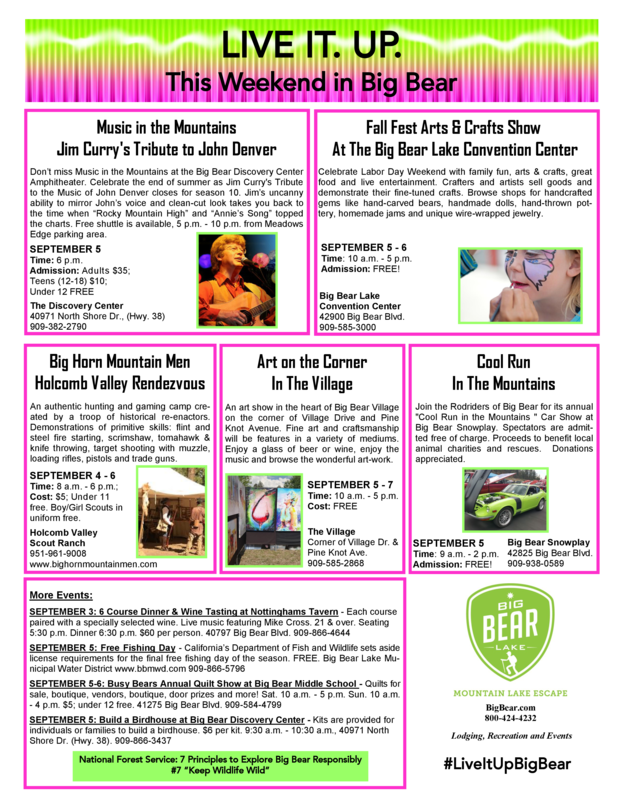 Fine Art and Craftsmanship will be features in a variety of mediums. Enjoy a glass of wine, enjoy the music and browse the wonderful artwork. Proceeds to benefit the Bear Valley Guild for the Arts. FREE for all to attend. Celebrate Labor Day Weekend with family fun, arts & crafts, great food and live entertainment. Crafters and artists sell goods and demonstrate their fine-tuned crafts. Browse shops for handcrafted gems like hand-carved bears, handmade dolls, hand-thrown pottery, homemade jams and unique wire-wrapped jewelry. For more information please visit website or call. Music in the Mountains “Jim Curry’s Tribute to the Music of John Denver” at the Discovery Center. Music in the Mountains presents Jim Curry’s Tribute to the Music of John Denver at the Discovery Center. Concert #4 in the 2015 season. The music of the late John Denver is like an old friend, outlasting trends and standing the test of time. Join acclaimed performer Jim Curry for this tribute to the music of one of the most beloved singer/songwriters ever to grace the stage. His music raised our conscientiousness to work toward a sustainable future for our world environmentally, socially and politically. Jim will close Season 10 Music in the Mountains at the Big Bear Discovery Center Amphitheater. Jim’s uncanny ability to mirror John’s voice and clean-cut look takes you back to the time when “Rocky Mountain High”, “Sunshine”, “Calypso”, and “Annie’s Song” topped the charts while his popular music delivered a heartfelt message that raised our environmental consciousness to care for our planet and each other. We could not do it without YOU, our ticket-buying guests, sponsors, in-kind donors and over 40 volunteers who make this unique concert series one of the best in Southern California. Your proceeds will help continue the year-round programming we provide at the Big Bear Discovery Center to over 200,000 guests. Our aim is to connect and engage our youth and adult visitors to help protect and conserve our treasured public lands while building greater stewardship values, respect and appreciation for our mountains. 2015 Dates: June 27th, July 18th, August 1st and September 5th. Please call or visit website for more details. 20th Annual Run For The Grizzlies! The Friends of the Big Bear Alpine Zoo invite you to their 20th Annual Run for the Grizzlies on September 12, 2015 from 9:30 am to 4:00 pm at the Bartlett Events Area in the Village. This is an annual Motorcycle Poker Run fundraiser supporting the Big Bear Alpine Zoo’s Grizzly Bears. The zoo will be relocating to a larger property and we want to use the funds to help build a modern habitat for our family of grizzly bears. The event is open to the public, all motorcycles are welcome. There will be 7 Poker stops that will go around Big Bear Lake, including a stop at the Big Bear Alpine Zoo for visiting the grizzlies. There will be opportunity drawings, prizes, a Chapter Challenge, vendors, BBQ, drink and live music. Registration the day of the event is from 9:30 am to 12 pm OR online at www.RunForTheGrizzlies.com. The cost is $30/rider and$25 for passengers and registration includes a Poker Run Pin & T-Shirt. 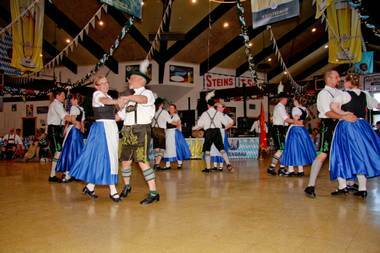 The Big Bear Lake Oktoberfest celebrates 45 years of German style family fun and good times this year. Rated Southern California’s #1 Oktoberfest, this Fall’s festival offers authentic German entertainment, food and beer! 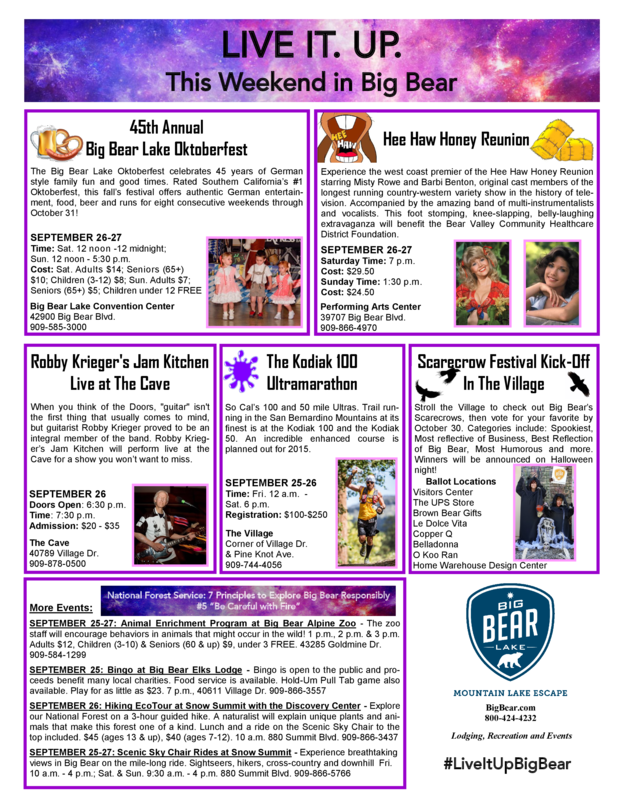 The Big Bear Lake Oktoberfest runs for eight consecutive weekends, September 12 through October 31 at the Big Bear Lake Convention Center, located at 42900 Big Bear Boulevard in Big Bear Lake. The times are Saturdays 12 noon to 12 midnight and Sundays 12 noon to 5:30 p.m. The Village Business Association (VBA) of Big Bear Lake hosts its annual Fall Wine Walk on Saturday, September 12, 2015 from 3:30 pm to 7:00 pm in the downtown Big Bear Lake Village shopping district. The merchant organized event will showcase fine wines from around the world and the Village’s unique businesses, with a portion of the proceeds to be donated to Big Bear Valley Education Trust, Christmas in the Village and numerous other events for the community. More details to be announced soon. Please vist website(s) in the meantime. Location: The Village of Big Bear Lake at corner of Pine Knot Ave and Village Dr.
September 19th date replaces the July date which had to be postponed due to rain, wind and lightning . July 18th registrations will be honored. Aaron’s Big Bear Big Bass Tournaments, Big Bear Charter Fishing and Big Bear Cool Cabins are hosting 6 bass fishing tournaments on Big Bear Lake this year. Championship Series events are on April 18, May 30, June 13, July 25, August 22 with a Two Day Tournament of Champions September 19-20. For tournament details please visit the website or call. Trail running in the San Bernardino Mountains at it’s finest will be on display for the Kodiak 100 and the Kodiak 50. Southern California mountains tend to surprise people, especially in September-its phenomenal conditions. It’s typically sunny, the temperature is almost always comfortable, considering this course is ALL between 5,100′ and 10,000′ . The groundwork for the 12th Annual Hot Dawgz & Hand Rails (HDHR) is already underway and we’re counting down the days until the biggest Winter Kickoff Party of the season! Saturday, September 26 fantastic riders will flip tricks on over 140 tons of snow made from ice trucked in the previous day! Bear Mountain has added great new features for the event this year, including a brand new entrance to the Red Bull Plaza, new features on the city center, & new features on the creeper ledge! We have also partnered with some of the biggest names in the industry to make this event even more killer than ever! Don’t miss out! Admission for public is FREE! For more details please visit website or telephone. Experience the West Coast Premiere of the Hee Haw Honey Reunion starring Hee Haw Honeys Misty Rowe and Barbi Benton, original cast members of the longest running country-western variety show in the history of television. Accompanied by the amazing band of multi-instrumentalists with gorgeous costumes and production numbers. Also starring special guest stars, vocalist Amber Carpenter and the Dancing Fiddle Player Amberly Rosen. Barbi & Misty salute the famous shows and stars they worked with over their 25-year careers. This is a foot stomping, knee-slapping, belly-laughing extravaganza benefiting the Bear Valley Community Healthcare District Foundation. The performances will be at the Performing Arts Center on Saturday, September 26, 2015, at 7:30 p.m. for $29.50 and Sunday, September 27 at 1:30 p.m. for $24.50, Call or visit website for tickets. Oktoberfest Locals Night Local’s Night – All Admission To Benefit Local Charities. Admission $5.00 or $3.00 with the donation of two non-perishable food items for Adults and Seniors – FREE for Children. Please call or visit website for more details. 6:30 am to 8:30 am Registration and Packet Pick up, 140 Business Center Dr. The 13.1 mile half marathon course will be an out and back course. The course is relatively flat with only 444 feet of elevation gain. Starting at the corner on Business Center Dr., runners will head east over Stanfield Cut-off before heading west toward Big Bear Dam on the scenic highway, through the National Forest, and the mountain hamlet of Fawnskin, past the bald eagle sanctuary, to the turn around point adjacent to Big Bear Lake. Both courses are out and back courses and are relatively flat. The 5K course has 125 feet of elevation gain and the 10K course has 255 feet of elevation gain. Since 2004, the Big Bear Lake October Troutfest has proven to be a popular outing for all members of your family. Come on up to the crisp clean air of Big Bear and enjoy a weekend among your fellow anglers as you fish for fun and thousands of dollars in cash and prizes! Please call or visit website for details. The 37th Annual Soroptimist’s Home Tour has a new date and concept for 2015 with the “Hearth and Home Tour. Revel in Big Bear’s fall foliage and delight in remarkable homes decorated with inspiration from the colors, sights, sounds and aromas of fall. Magic fills the crisp autumn air as holidays in the mountains draws near. Historic Big Bear Valley shows off its homespun charm during the Hearth and Home Tour, sponsored by the Soroptimists International of Big Bear Valley. The Hearth and Home tour is a great opportunity to stroll through four amazing homes in the sky professionally decorated for fall and the holiday season! Enjoy the best of Big Bear’s fascinating range of private homes with cozy home-fires burning and the scents of apple pie and cider will embrace your, during Soroptimists’ 37th annual home tour. Experience the Big Bear Alpine Zoo’s nocturnal animals. As soon as the sun sets and the stars begin to shine the nocturnal animals activate, and their natural instincts take over. Many of the animals that are hard to see by day come alive by night. Come see the sights, sounds and shadows of nature when the sun sets. Imagine having the eyes of a wild animal sparkle from the light of your flashlight or listening to the wolves and coyotes howl in total darkness. Exploring the zoo after dark is an experience of its own. Come see how the mountain lions, bobcats, wolves, grizzly and black bears, and many other animals react to the night life. Gates open 6:30 PM and close at 7:00 PM to start the tour. Bring your flashlight and wear warm clothes. Regular Admission: Under 3 years old free, for ages 3-10 $6.00, and over 10 years old $9.00. One of the earliest and most important ska revivalist groups, Birmingham’s English Beat formed in 1978. The multiracial band carved a distinct sound through the use of alternating lead vocals by guitarist Dave Wakeling and punk toaster/rapper Ranking Roger. The Cave is a new, intimate music venue with state of the art sound and lighting that promises to bring you up close and personal with its performers. Doors open at 6:30 pm Concert starts at 7:30 pm. Call or visit website for ticket information. Bring your kids to the safest place to Trick-or-Treat this Halloween! With 50+ places to stop for candy you are sure to fulfill your sweet tooth. Take a walk through the village seeing all the horrors that it has to offer! Don’t forget your costume or you’ll miss out on the trick or treating! Location: The Village of Big Bear Lake at 630 Bartlett Rd. Bring the children on this special day for a late afternoon/early evening of Tricks ‘n Treat “Visit the graveyard and pumpkin patch, as well as the goblins throughout the zoo. There will also be games, prizes and costume contests”. Also enjoy seeing the zoo animals receive their Halloween treats too! CHRISTMAS WITH THE NELSONS tells the story of three family Christmases in the lives of America’s Favorite Family- The Nelsons.This heart-warming multi-media live concert experience stars the third generation of #1 Nelson Family hitmakers, Matthew and Gunnar Nelson. A genuine blend of Everly Brothers-style harmonies and Smothers Brothers-style comedy, multi-platinum recording artists Matthew and Gunnar have been thrilling sellout audiences world-wide for the past decade with their high-integrity Ricky Nelson Remembered show… and they’ve got a new gift for you to open. NOT merely a rock concert with a few holiday songs thrown in… CHRISTMAS WITH THE NELSONS delivers Christmas Classics the Nelson Family way. Interweaving quick humor, soaring sibling vocals, and state of the art big screen video, Matthew and Gunnar’s completely new show will take you on a sleigh ride through time. The 3rd Annual Big Bear Turkey Trot consists of 3 mile, 6 mile, and 9 mile Road Runs on Thanksgiving Day with Start/Finish line located at Meadow Park. This is a FUN event for the whole family. The run course is a relatively flat 3 mile loop through the neighborhood of Eagle Point, with 6 mile runners completing 2 laps and 9 mile runners completing 3, making it easy for all abilities to participate. Turkey Trots are run on Thanksgiving Day in anticipation of the large meal to be had later on. Other traditions include a “turkey” prize for the overall winner and runner costume contest. In addition, a portion of race entry fees will be donated to the Big Bear Senior Center holiday food drive. The 9 mile race starts at 9:00 am, 6 mile starts at 9:15 am, and 3 mile starts at 9:30am. Registration fees are $40 for 3 mile run, $45 for 6 mile and $50 for 9 miles. Let the holiday shopping begin! Featuring more than 50 artists and crafters who specialize in handmade unique arts and crafts. It’s a great place to shop for truly unique Christmas gifts! The Christmas Boutique takes place Thanksgiving weekend. Doors open at 10:00 a.m. each day and the shopping fun continues until 5:00 p.m. Friday and Saturday. For more information please call (909)585-3000 or visit website. Come and Enjoy the Festivities at Santa’s Grand Entrance in the Village. Entertainment starts at @ 5:00 PM and Santa and Mrs Claus will arrive in his sleigh at @ 6:00 PM. Santa will also be at the Xmas Tree Lot every Weekend from 10-4 pm until December 20th.